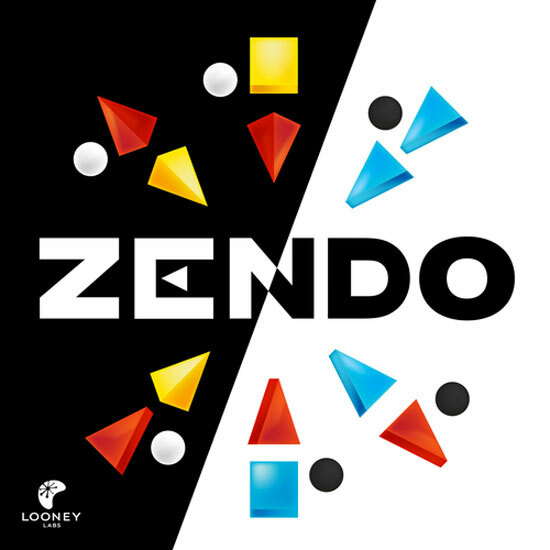 We review Zendo, the abstract strategy board game published by Looney Labs. In Zendo, players are trying to guess the secret rule that only the moderator knows by examining the structure created. Zendo from Looney Labs, released originally in 2001, is a game where one player knows the secret rule and players race to determine what that rule is. This is accomplished through the building of structures. 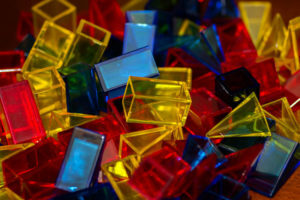 Pieces are similar to those in Looney Labs’ Pyramid Arcade, but also include wedge and block shapes to increase the number of options available to build from. Zendo is a 2-5 player game that takes about 20 minutes. It plays best with 3-5 players, are the 2 player version is a variant that changes some of the key rules. Secret rule cards come in three different difficulties and have several options. After the moderator creates the structure, each player will take turns also building a structure. Then, they have the options of asking the moderator if it follows the rule or not or having a quiz. If they choose “tell”, the moderator will mark the structure with a white disc if it meets the rule and a black stone if it doesn’t. During a quiz, all players will secretly guess if it meets the rule or not. Whoever is correct will earn a guessing cube that they can spend to attempt to tell the moderator what the rule is. If you make a correct guess after spending your cube, you win! However, if the rule you guess isn’t correct, the moderator must prove you wrong by making a structure that meets the rule but doesn’t meet your guess, or meets the guess but doesn’t meet the rule. The rules for a 2-player game differ slightly as players take turns being the moderator. There are no quizzes or guessing cubes, you simply build structures until you can solve the rule. You then calculate your score based on the number of structures you had to build and any incorrect guesses you made along the way. After both players had a chance to moderate, the one who solved the rule most efficiently wins. Structures that meet the rule are marked with a white disc; those that don’t are marked with a black one. A game Zendo is really hard to wrap your head around. Trying to decide when to try to go for a quiz, rather than just getting more information, is about the only game element going on here. It kind of an interactive puzzle where it can be more fun to just work through it than to worry about who is going to win or lose. 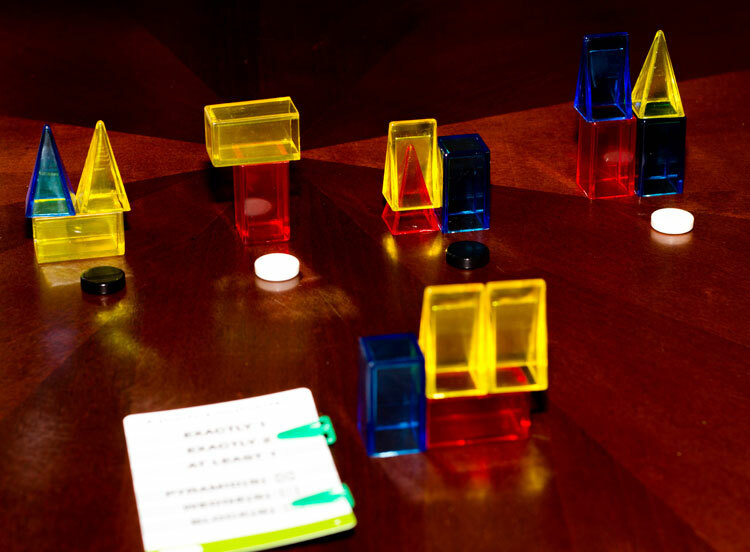 There are, undoubtedly, a lot of great applications for something like Zendo as an educational tool. It is pure inductive logic and folks that really understand how to narrow down the possibilities will be able to do well. Computer programmers will certainly feel right at home. Three different colors and shapes are available for your logic-puzzle building needs. Playing as the moderator, there isn’t much you get to do. Depending on how elaborate you build your initial structure, you can make it slightly easier or more difficult for the players. You also get to build structures to prove their guesses wrong, which gives you an additional opportunity to influence how much information they have. I expected moderating Zendo to be way more enjoyable than it actually was. The moderator just kind of sits there and hands out discs. The games don’t last a terribly long time though, so your chance to let someone else moderate so you can play should come around swiftly. Attempting to guess the rule is quite enjoyable. You try to maximize how much information you get for each structure you build. However, all the info you get is also available to the other players so you have to be cognizant of what they are doing. Often times you can figure out the train of thought other players are going down by evaluating what they are building. That said, if you have a particularly sadist moderator, the game can get incredibly difficult and last quite a long time. The rulebook gives options for how to deal with situations where no one is able to guess the rule within a reasonable timeframe, but it puts the onus largely on the moderator to help out. With my group that is often very competitive, it wasn’t easy to bring games to an end quickly. In general, I’ve enjoyed playing Zendo. There are dozens of different rule cards, each with multiple options to select, so there is a near endless supply of rules you can use. In that respect, the game has quite a bit of replay value. It sometimes feels a bit like a brain teaser though. It is fairly short, yet I don’t find myself wanting to play Zendo more than a couple of times before moving on to something else. I think it teaches an extremely valuable skill to folks though. Logical reasoning is a powerful tool with practical applications. If you have a desire to use Zendo as a teaching aid of sorts, it works wonderfully. As a puzzle it can be enjoyable in short spurts. As a game, it falls a bit flat. 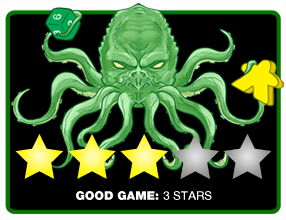 Final Score: 3 Stars – A fun activity that doesn’t always work as a game. It is a good educational tool, but can quickly wear out its welcome. I played Zendo a couple times on the recent DiceTower Cruise. I agree it is more of a puzzle solving experience than a game. However, it was interesting from that point of view. I can agree that I would not,want to play it over and over in succession. After two plays, the three of us (led by a fourth person determining what 4th puzzle would be each time) wanted to move on when asked if we wanted to play again. I much more look forward to the next Looney Labs game, Get the MacGuffin due in April. I played that over and over…maybe 20 times. Just 23 cards in the game, but some thought needed to play well. I would say knowing the cards and their “powers” makes it easier to feel you have real control over your play. But that’s easy enough to achieve even just playing a few times without pre-study of all the cards.